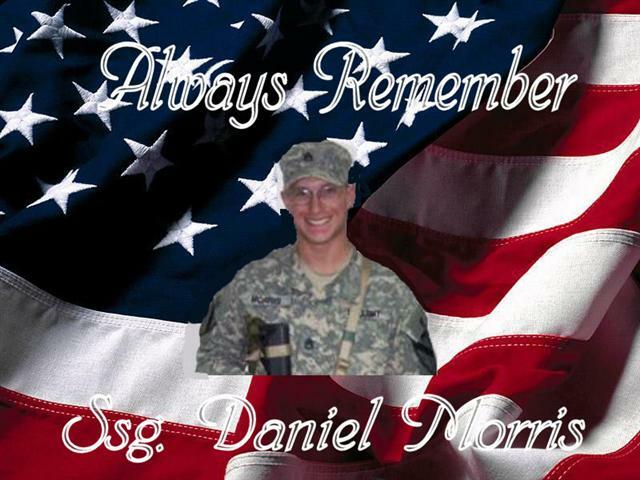 Staff Sergeant Daniel M. Morris, 28, of Clinton, Tenn., died Nov. 25 in the Diyala province, Iraq, of injuries suffered when an improvised explosive device detonated near his vehicle. SSGT Morris was a seven year veteran who recently re-enlisted for another four. He arrived in Iraq in mid-September for his second tour in Iraq. He was assigned to 1st Squadron, 12th Cavalry Regiment, 3rd Brigade, 1st Cavalry Division at Fort Hood, Texas. 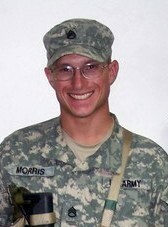 SSGT Morris was born on May 15, 1978. He graduated from Clinton High School in 1996 and joined the Army in 1999, graduating from AIT at Ft. Benning, Georgia. Daniels first unit was 3rd Platoon, C Company, 2nd BN, 2nd Infantry Regiment, 1st Infantry Division in Vilseck, Germany where he served as a rifleman and a Bradley Operator. After that he was stationed at Ft. Hood, Texas with 2-7 CAV where he served as a Bradley Gunner and a Team Leader. He served with A Co 2-7 CAV during OIF II as a Team Leader in Taji, Iraq. 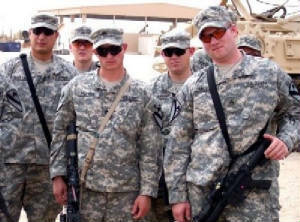 He then served with A Co 1-12 CAV as a Squad Leader, and was deployed to Iraq for a second tour. Morris was a graduate of the Primary Leadership Development Course, the Modern Army Combatives Course and the Combat Lifesaver Course. SSG Morris’ awards include the Combat Infantryman’s Badge, The Bronze Star, The Purple Heart, The Army Commendation Medal, Army Achievement Medal (four oak leaf clusters), and The Army Good Conduct Medal (one knot). His parents, Glenn and Amy Morris, said that since he was a child, their son had always wanted to be a soldier. He believed in God and country and planned to go to college to become a minister when he got out of the service. Glenn Morris said his son re-enlisted because he had a "soft spot for the Iraqis." "Not only was he my brother and a father and a son, he was the best man I've ever known," said SSGT Morris's 25-year-old sister. "He wore the weight of the world on his shoulders every day." SSGT Morris leaves behind a 10-year-old daughter, Alexys. Survivors also include his parents, a sister, a brother, and his grandparents. Funeral services are set for Saturday, December 2 at Holley Gamble Funeral Home in Clinton, TN. Burial with full military honors will be in Oak Ridge Memorial Park on Sunday. In lieu of flowers, family members are asking for contributions to a fund set up for his daughter, Alexys Morris, at ORNL Credit Union. 1117 N. Charles Seivers Blvd Clinton, TN 37716. Phone number: (800) 676-5328 . An address listed here previously was for the wrong branch! This one should be the correct one. Sorry about that! This is a page I never even considered having to put together. I did it with tears in my eyes. are grieving along with me. His death has touched us all deeply. send our sincere condolences to the Morris family. 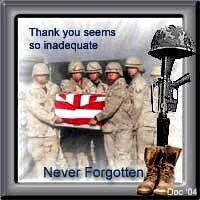 Your father, son, brother, grandson was a hero and we all salute him. SSGT Morris' aunt has sent this link to a site that is offering memorial magnets and dog tags with SSGT Morris' photo on them. These are very nice, you may want to take a look at them.